They do this whether they are building flood defences, designing space rockets, leading a company, rehearsing a difficult conversation with an employee or whatever. Such people then stress test the strategies to see how they will work under every conceivable scenario. Sometimes this leads to confirming the strategies. Sometime it leads to making adjustments. Sometime it leads to starting again. People then do the work. Keeping a constant eye on what is happening, they build on what is working and find solutions to challenges. People keep going until they achieve success. Looking at your own life, can you recall a time when you stress tested the strategies you planned to follow? You may have done this when preparing for an interview, leading a project, tackling a tough challenge or whatever. What did you do to stress test the strategies? How did you clarify the potential difficulties? What plans did you make to deal with the challenges? Describe a specific situation when you stress tested the strategies before then implementing them successfully. Describe the specific things you did to stress test the strategies. 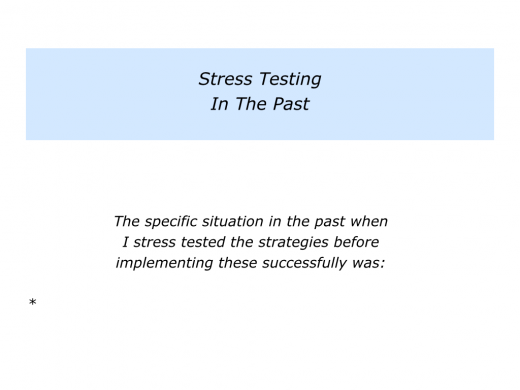 Describe the specific benefits that resulted from you stress testing the strategies. Some organisations refuse to consider challenging scenarios. When problems occur, they try to pass the buck or say that such events were unpredictable. Some events appear to come out of the blue, but it often emerges that the leaders had failed to take heed of previous warnings. Great organisations stress test their strategies before implementing them fully. They also often invite outsiders to give a view and think the unthinkable. Consultant companies have a mixed reputation in this regard, but they can still provide valuable advice. 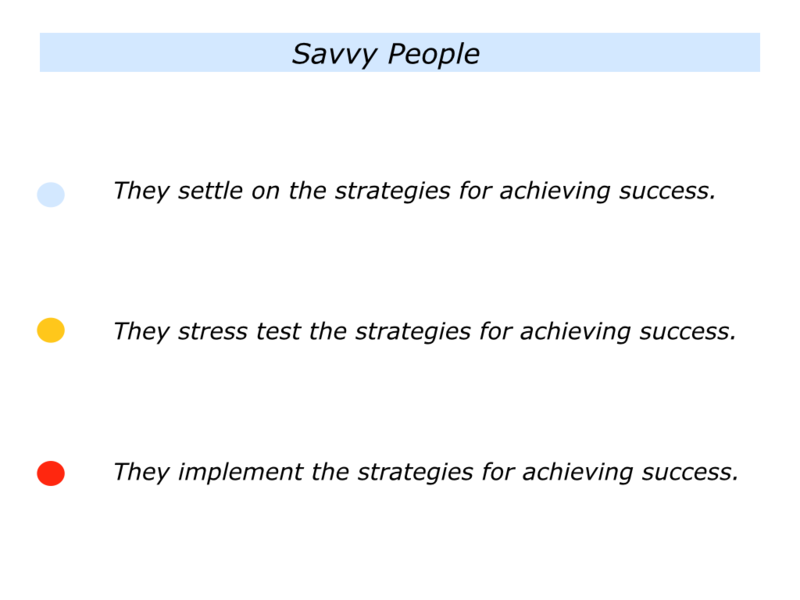 McKinsey & Company, for example, have produced an excellent article on this theme called Have you tested your strategy lately? Below are just a few of the questions they ask. You can read the full background to these and more questions via the following link. Will your strategy beat the market? Does it tap a true source of advantage? Does it embrace uncertainty? Does it balance commitment and flexibility? Is your strategy contaminated by bias? Is there conviction to act on your strategy? Have you translated it into an action plan? Many years ago I worked with a yachting team that took part in a round-the-world race. After answering questions similar to those listed above, they then practiced implementing the strategies. The crew began by getting the basics right in icy but relatively good conditions. They then kept increasing the difficulties of, for example, rescuing a man who had fallen overboard. “But wasn’t that risky?” you may ask. Certainly it was dangerous. But it would have been even more dangerous to set out without knowing how to rescue somebody in a heavy sea. Great teams settle on their chosen strategies and get the basics right. They then increase the stress levels to ensure they can perform brilliantly when under pressure. They keep asking the following questions. What are our goals? What are the real results we want to achieve? What is the picture of success? What will be happening that will show we have achieved the goals? What will people be saying, thinking, feeling and doing? What are the key strategies we can follow to give ourselves the greatest chance of success? 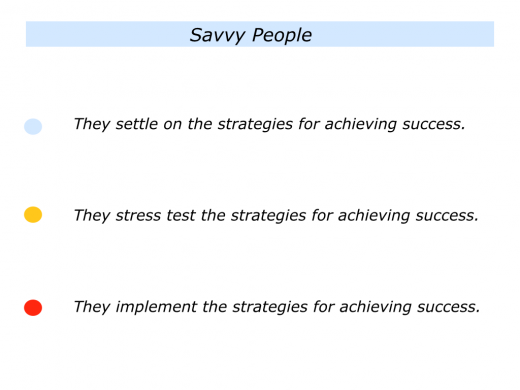 How can we implement the right strategies with the right people in the right way? How can we give people the support they need to achieve success? How can we enable our people do superb work? How can ensure people proactively report their progress towards achieving the goals? How can we encourage them to focus on constant improvement? What are the difficulties we could face on the way towards achieving the goals? How can we prevent some of these difficulties happening? What can we do if, despite everything, these difficulties do happen? How can we then find solutions to the challenges? Let’s take a reality check. On a scale 0 – 10, how high would we rate our chances of achieving success? What can we do to maintain or improve the rating? What else can we do to give ourselves the greatest chance of success? Great individual workers also ask similar questions. They then rehearse how to translate the strategies into action. Sometimes they do this in real conditions; sometimes they may use mental rehearsal. Whatever method they use, however, they aim to rise to occasion when it matters. Let’s return to your own life and work. 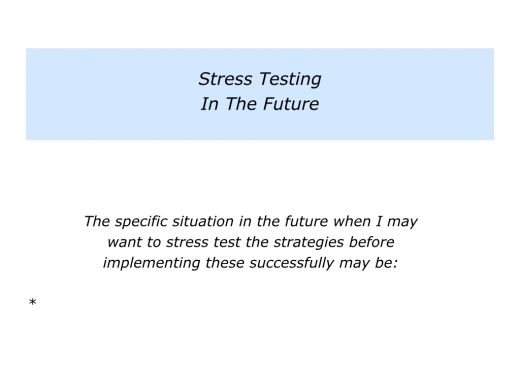 Looking to the future, can you think of a situation when it would be useful to stress test your strategies? This could be a personal or professional situation. You may be aiming to take an exam, rebuild your team, deal with a potential crisis, have a difficult conversation with people or whatever. Let’s assume you have settled on the key strategies you can follow to achieve success. How can you stress test these strategies? How can you, if appropriate, make the necessary adjustments? How can you then implement your chosen action plan? 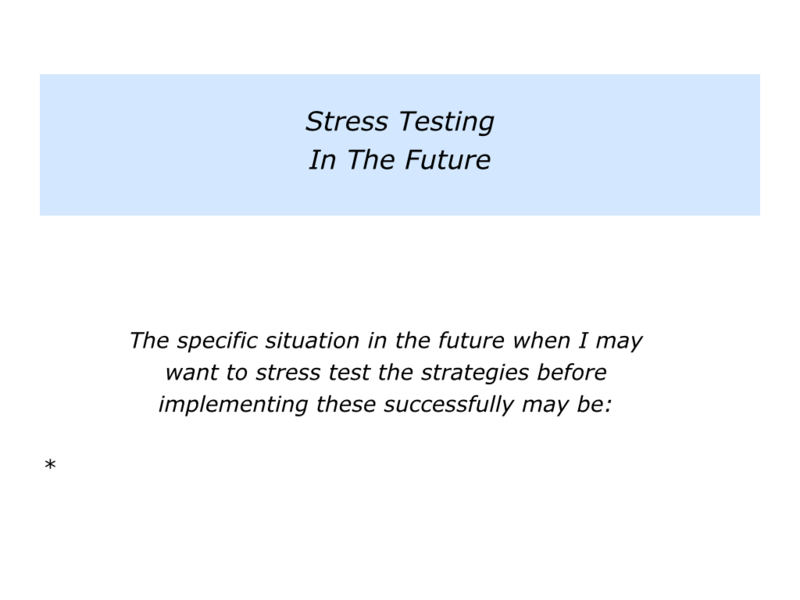 Describe a specific situation in the future when it may be useful to stress test the strategies before then implementing these successfully. 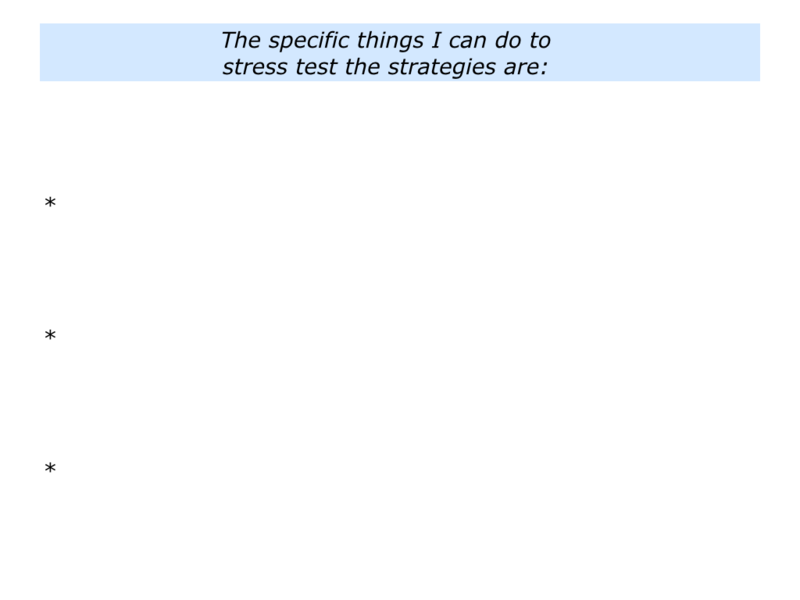 Describe the specific things you can do to stress test the strategies. Describe the specific benefits of taking these steps.